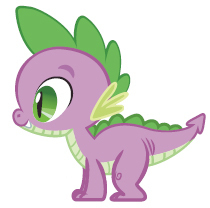 Spike. . Wallpaper and background images in the My Little Pony - La Magia de la Amistad club tagged: my little pony friendship is magic spike. is he ever on all fours? Lol, it does look a bit odd to see him in that position. He looks like a pet on all fours.